With fries & tomato sauce? I think because they were advertised as for a limited time but now appear to be there permanently or have no details as to when the limited time expires. Good point, but there are never any details about when a limited time offer expires. That’s the whole point about a limited time offer. If a company sees their limited time offer is doing well they may extend the time it is available past the (usually in-house, non-advertised) end time of that offer. Plus, it doubles as a perfectly legal, perfectly acceptable marketing tactic to get people in to try the offer before time runs out. I haven’t had McDonalds nuggets for about ten years but the pictures here are making me REALLY hungry. What’s the point of getting rid of them? I used to love Chicken McBites and was extremely disappointed when they were removed from the menu. What do you guys think taste better, McDonald’s McNuggets or KFC’s Nuggets? To change topic a bit, went to Hungry Jacks today (and yes, I’ve been regretting it) but when going through Drive Thru do any other stores have them constantly saying “Is that all?” at the end of every item in a tone that sounds as though you’ve annoyed them for giving them an order. It happens at all the stores at I’ve been across Tasmania and it’s as though that’s what they’ve been trained to do but it’s really quite offputting especially when they say it before you’ve even finished saying what your first item is. Surely it would be better to wait until the customer actually adds a pause or sounds like they’re finished before asking. Remove 24 nuggets? Then what will I have after a big session? Most places I go to either say “Is that all” or “Anything else”. KFC nuggets by far. HJs nuggets are good too, they’re like a hybrid between KFC and Macca’s nuggets. That bucket was still around in some McDonalds when I was last in Japan in 2016, albeit the price wasn’t all that great. The 200 JPY deals they had at the time were extremely good though, as they were still in that period of redemption where they were trying to win back Japanese consumers after a bad run of publicity. 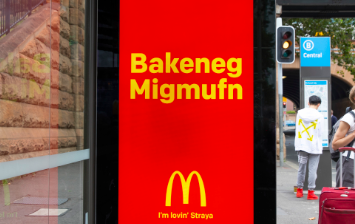 Clever advertising by McDonald’s over the Australia Day long weekend. Carls Jr opened another Melbourne store in the Docklands the other week. I went to check it out on Saturday night and it was pretty busy… at least a 25 min wait for our food. Although of all the American food chains that have come here, for me Carls Jr is one of the rare ones that I actually like better here than the US. I was never a fan of Carls Jr over there (it came across more like Hungry Jacks to me) but in Aus it seems to be a bit more gourmet burger. Probably my second fave burger joint behind New York Minute. Heading over to NZ next week so I might give Wendy’s a go; they have an outlet in South Dunedin according to Google. I hope I don’t regret it afterward! I will also probably visit Queenstown’s institutional Fergburger again; the trick there is to go mid-late morning when the hangover/breakfast crowd diminishes. I’m assuming that Wendy’s NZ is more like Wendy’s in the US rather than Wendy’s in Australia. Wendy’s in NZ is the same as Wendy’s in the USA, they have both Wendy’s, Australia and US versions. Wendy’s AUS recently rebranded in NZ as Shake Shed & Co.
I’m also in NZ next week and plan on trying out Fergburger. Probably overrated but gotta give it a go. Having had Shake Shack in Japan in recent weeks and found myself pleasantly surprised that it was on par with when I last had it in NYC in 2013. Would be great to see them expand into Australia. It is very apparent that a lot of burger restaurants rip off (or pay homage too) the style of burger that Shake Shack makes. Grill’d is launching a new menu from March, which will feature more vegetarian and vegan burger iteams. Its aim is to have half of its burger menu plant-based by 2020.